RS1 - Single Adjustable Monotube Damper for Street and Track. Utilizing a mono tube design with a high flow piston ensures the smoothest possible ride in normal conditions while the bleed adjustment gives the ability to tune for racing situations. Unlike many other single adjustable suspensions, damping balance is carefully maintained between compression and rebound. This damping balance is critical to maintaining tire contact with the road in addition to controlling the main mass of the vehicle. To satisfy the diverse needs of each driver’s application, the JRZ RS1 has an extra large adjustment range. With a few clicks you can turn your smooth street car into a crisp, rock solid track car in seconds. RS - Double Adjustable Twin Tube Damper for the Street and Track. 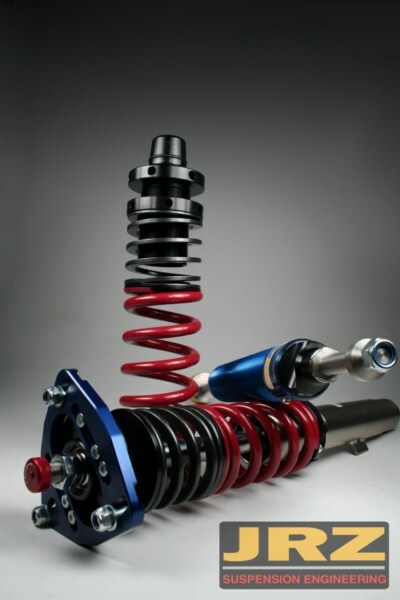 The JRZ damper is an advanced development in high performance shock absorbers. The JRZ RS is a high gas pressure double adjustable twin tube damper, without the use of an external reservoir. Applying race winning technology, JRZ designed the JRZ RS to give precise chassis control when driving on track and ultimate comfort for daily driving. Easy to install, the JRZ RS is available as a complete kit with mounting hardware and springs for all applications we support. 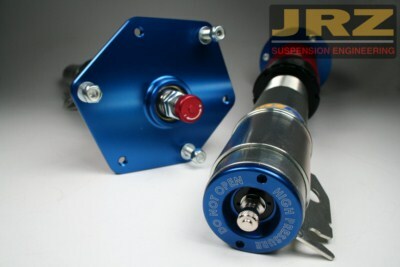 JRZ Suspension Engineering offers the best high performance club sport damper available today. Combining the best aspects of our JRZ RS and 2-way racing damper, the JRZ RS Pro gives the owner ultimate suspension tuning ability while maintaining compliance for driving on public roads. A mono tube double adjustable damper with adjustable gas pressure, the JRZ RS Pro offers an increased adjustment range allowing the user to tune the car to their further needs. The JRZ RS Pro is available as a complete kit with springs and mounting hardware.